Salmon are beefy fish that can be prepared in the same manner as meat and poultry. They are firm enough to withstand the rigors of grilling and smoking but are just as delicious baked, broiled, fried, steamed, sautéed, or served on a sushi menu. All salmon, even in canned form, are high in Omega-3 fatty oils and are loaded with B vitamins and calcium. Cooking fish at home may seem daunting at first. This is an excellent “starter” fish that can be prepared with confidence, even by inexperienced cooks. Most Atlantic salmon are farm-raised. Hot or cold smoked salmon may be marketed as kippered, cured, or brined. Farm-raised and smoked salmon (lox is one variety) are available year-round. May-October are the peak months for Pacific salmon. 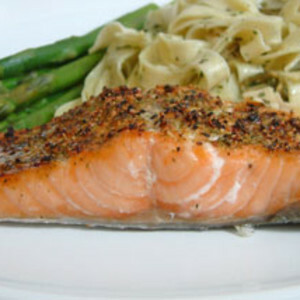 Salmon is sold whole or as thick steaks and fillets. Smell is the first test of fresh salmon; it simply should have no fishy smell. When purchasing fresh from a market, ask to touch the flesh. It should be moist but not slimy and will spring back when pressed. Cold-packed salmon in packages should have no liquid or ice crystals. Fresh salmon can be frozen for about four months if double-wrapped. For best flavor and texture, however, you should enjoy the superior taste while it’s fresh. Remove and rinse packaged salmon. Place on a rack in an ice-filled pan and cover tightly until ready to use. Canned salmon is good for about 12 months, but must be refrigerated and used within two days after opening. Apply a good coating of oil to racks before grilling or cooking in the oven to avoid sticking. Salmon flesh contains natural oils, which can cause dangerous flare-ups over coals. Keep whole salmon intact while cooking (any method) to hold in juices. The same rule applies for steaks and fillets: leave the skin on until it is ready to serve or the flesh may fall apart. Swordfish and halibut are top alternate choices, but tuna is a good grill substitute.